(Clockwise) "Bookstone", "Candoll", "Talismandra", and "Penciplume" Summoning "Chalislime" in the artwork of "Impcantation Inception"
"Impcantation" (魔神儀（デビリチャル） Debiricharu) is an archetype that debuted in Cybernetic Horizon. 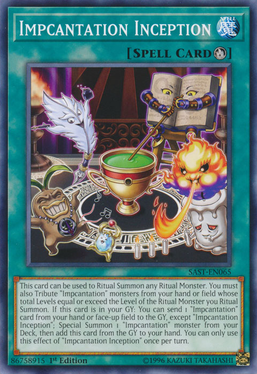 The archetype is focused on supporting Ritual Summons. This page was last edited on 23 February 2019, at 04:09.